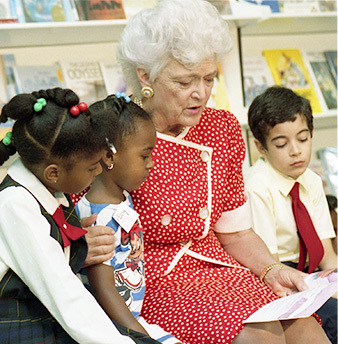 A beloved First Lady, proud mother of six children and accomplished author, Barbara Bush believed that every American should have the opportunity for an education, no matter their age. Right now, you can honor the life and legacy of Mrs. Bush by making a donation to the Barbara Bush Foundation for Family Literacy. Your gift can change the lives of children and families now and for generations to come. If you are interested in leaving your own legacy of literacy, please consider including the Foundation as a charitable bequest in your will, trust or other means of planned giving. For more information, please contact us at 850-562-5300 or email us at info@BarbaraBush.org.